Still on the catch up tip here with past news. Late last week one of our followers on Twitter (thanks @taftmorgan) alerted us to changes that are coming to the MBNA Rewards World Elite Mastercard. This was following by a bunch of emails from our readers (thank you David, Doug, Michael and others!) and several comments on our site about these changes along with screen shots of the letters detailing the changes. So first a big thank you to our loyal readership base for sending us all the details on the changes that are happening to the MBNA Rewards World Elite Mastercard. There are also changes happening to two other MBNA cards that we will cover in future posts. For those who have this card mainly as a cash back card this is not good news. These negative changes will make the card drop from its 2nd place position in our Cash Back Rankings for 2019 unless of course other cards devalue to be worse than this one. Honestly if you are on the hunt for cash back you will be better off now with the Rogers World Elite Mastercard since it earns 1.75% cash back on most purchases (more on some others) has no annual fee and has a better insurance package than the MBNA card. Remember as well this is one of few cards that lets you redeem monthly for cash back - not once per year like many cash back cards so this lower rate should be taken advantage to cash out at your best return possible. We have featured this card predominantly on our website in our various rankings, Ultimate Credit Card portfolios and other features since it is (was) basically the strongest Mastercard in the market for earn. These we'll have to re-evaluate and adjust some of those articles that use the card for the cash back redemption rate and not the travel redemption rate. Although since the main change isn't happening until 2019 we will keep the card as is on our Top Cash Back ranking but will have a disclaimer stating the fact the card will be changing. We ask that you are patient with as us we adjust all the relevant features on the site as required over the next few months and we'll let you know when they are completed via our daily update posts right here on the blog. 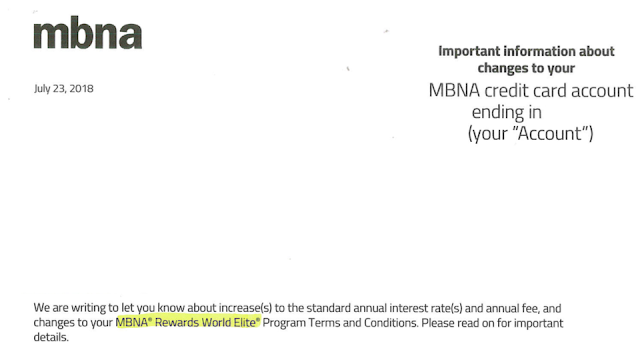 For your information here is the current offering for the MBNA Rewards World Elite Mastercard - as you can see if you apply for it between now and August 31 you'll only $89 for the card, get the $100 bonus and earn 2% until the end of January at which point you could cash out and cancel the card if you like. If you currently hold this card we'd love to hear your thoughts on these changes! Are you going to keep the card or move onto to something else? Let us know below!